We’ve just returned from Microsoft UK’s Specialist Team Unit (STU) conference where we were chosen to present to Microsoft’s senior leadership team. Each quarter the STU, who are responsible for driving revenue within Enterprise customers, gather for two days to discuss the strategic roadmap and pipeline for the forthcoming financial period. 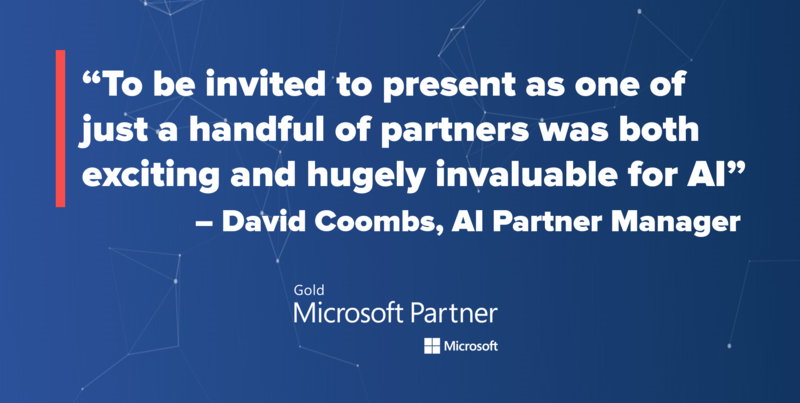 We were selected as a key partner to present to over 340 Microsoft delegates at De Vere Tothworth Court to showcase how we align with Microsoft and the added value our industry leading AI.DATALIFT solution brings to their Azure and Modern Workplace offerings. We spoke to the hundreds of delegates about how we deliver data innovation for our customers, before hosting three of our own packed out breakout sessions specialising in Public Sector, Retail and Financial Services. Partner Manager at Automated Intelligence David Coombs said, “To be invited to present as one of just a handful of partners was both exciting and hugely invaluable for AI. This was about further developing our relationship with Microsoft, the industry sellers and, of course, the senior leadership team, as well showing how Automated Intelligence and Microsoft can jointly deliver great solutions for our customers.